This week I received a second “everyday tourist” care package from my third cousin Sally in Los Angeles. In it were more historical Calgary postcards she hunted down at the Vintage Paper Fair, in Glendale, California. This time (last time it was a vintage CANADA Vacations Unlimited magazine from 1951), her big find was a bunch of postcards of Calgary’s mid-century motels, which coincidentally were mostly along the Trans Canada Highway (aka 16th Avenue N) near 19th Street – just blocks from where I live. It was 1962 when the Trans Canada Highway opened and in Calgary, it went right through the City’s northern inner-city communities. While today the urban planning buzz term is “urban village,” back in the ‘50s and ‘60s Calgary was famous for its “motel villages” both along the Trans Canada Highway (between 19th and 24th Streets NW, aka Crowchild Trail) long before the University of Calgary existed and the other in Montgomery (between 43rd to 46th St. NW) which didn’t amalgamate with the City of Calgary until 1963. After 50+ years, a few of the modest old motels from the middle of the 20th century still exist, although most have had a facelift or two. Names like Red Carpet Inn, Thriftlodge, Days Inn, and Traveller’s Inn dot the streetscape along the Trans Canada highway in Montgomery. While the Motel Village next to McMahon Stadium includes names like Super 8, Travelodge, Thriftlodge and EconoLodge, as well as hotel brands like Best Western, Hamptons and Ramada. There is even a funky boutique hotel – Aloft. However, the classic mid-century modern motels like the Mount Eisenhower Motor Court, the Highlander Motor Hotel and the Cavalier Motel are gone - survived only by these postcards. The Highlander Motor Hotel located on the Trans Canada Highway at 17th St NW provides ideal connections to Downtown, a multi-million dollar Shopping Centre, Jubilee Auditorium, McMahon Stadium and The University. Today it is the site of the Home Depot. Calgary North, Travel Lodge, 2304 16th Ave NW. Bus at the door.Your Hosts: Ed and Carol Sandor (A member of the world's largest network of hotel). The Cavalier Motel, 2304 - 16th Ave NW. The essence of luxury - 50 modern units, equipped with televisions and telephones. Large heated swimming pool, adjoining restaurants, close to the largest shopping centre on the Trans Canada Highway i.e. North Hill Shopping Centre. Yes, the North Hill Shopping Center opened in 1958 and it was not only Calgary's first shopping center, but the largest along the entire Trans Canada Highway. Mount Eisenhower Motor Court, 2227 Banff Trail, 20 new units, modern AMA & AAA approved. If you drive or even a walk along the Trans Canada Highway today, you still see bits of evidence of how this was once Calgary’s most important vehicular street, long before the Deerfoot, Glenmore and Crowchild Trails or Memorial Drive. It was, and still is, the gateway to Calgary’s first post-secondary campus – Southern Alberta Institute of Technology (SAIT). At one point, it was also the gateway to the Calgary Airport located in Renfrew. The historic Rutledge Hangar (731 – 13th Ave NE), built in 1929, is the only building remaining from Calgary’s first publicly operated airport, commonly known as the Stanley Jones Airport. It was the first airport in Canada to install runway lights to facilitate twilight landings. It was also home to a short-lived airmail service for the Prairies and served as a training site for the Royal Canadian Air Force in World War Two. In addition, to small retail shops and restaurants all along 16th Avenue North, it was the gateway to Calgary's first shopping center - North Hill Shopping Centre in 1958. Calgary’s iconic Peters’ Drive-In (219-16th Ave NE) located on the Trans Canada Highway is another testimonial to 16th Avenue’s mid-century, automobile-oriented history. Today you will still find numerous Tire, car parts and oil change shops along 16th Avenue. Banff Trail Motel is typical of the many modest motels that use to exist all along 16th Avenue North in the mid-20th century. Trans Canada Highway at Motel Village looking east with the SAIT residence in the background. Calgary's Motel Village today is a hub of low-rise motels, an office building and 10+ restaurants. It is walking distance to the University of Calgary, Foothills Medical Centre and Southern Alberta Institute of Technology campus. It is adjacent to a LRT Station that is just 5 minutes from downtown. In downtown, while the Palliser Hotel adjacent to Canadian Pacific Railway Station was the City’s signature hotel, the Caravan Motor Hotel with its Steak and Rib House (4th Ave and 4th Street SW) touted itself as Calgary’s finest downtown motor hotel, only three minutes from the city centre. Another reminder of just how much our city has changed over the past five decades. But for me, the best postcard was of the Bow River Motel (103, 24th Street NW aka Crowchild Trail). On the back was their motto “It is quiet by the river” and the phone # AT 3-0777. It was a reminder that not that long ago Crowchild Trail was a tranquil dirt road with no sidewalks and lined with small businesses and homes… a far cry from the speedway with bland, concrete sound barriers that it is today. Caravan Motor Hotel and Steak and Rib House, 89 ultra modern units, completely air-conditioned, each room thermostatically controlled. TV, Hi Fi, Radio. Complete room service. Bow River Motel, 103, 24th St. NW (aka Crowchild Trail). Note the road looks like it is still dirt and there are no trees or sidewalks. This was the edge of the city in the '50s. I couldn’t help but wonder if 16th Avenue North hadn’t become the Trans Canada Highway in the ‘60s, would have it evolved into a more pedestrian-oriented, retail street like 17th Avenue South. Just wondering. As “everyday tourists” we are always looking for creative ways to have a tourist experiences even when we are at home in Calgary. Recently, friends invited us to join them for dinner at Fleur de Sel, an established Parisian-style restaurant in Calgary’s trendy Mission district. Of course we said “yes,” but what we didn’t anticipate was how the dinner would bring back vivid memories of our past trips to Paris and Lyon. Charming Fleur de Sel restaurant in Calgary's tony Mission district. As soon as we walked into Fleur de Sel, we were immediately reminded of the charm of Paris bistros. Upon looking at the menu, I noticed one of the items was cassoulet, a traditional peasant dish of meat and beans that is popular in Lyon. This immediately conjured up memories of one evening in Lyon, France ironically with the same friends. One of our best meals was a cassoulet dinner in an off-the-beaten path old house that had been a bouchon for over 200 years. Not only was the cassoulet excellent, but they also offered us a couple of free brochette de quenelles they had made for the early seating and wouldn’t keep for the second seating. I finished the meal off with a flourless chocolate cake that was perhaps the most decadent dessert I have ever tasted. My mouth waters even now thinking about it! Decadent flourless chocolate cake in Lyon, France. The memories didn’t end there as we quickly all recalled that special night didn’t end with the meal. While walking back to our hotel, we heard some music a few blocks away, so decided to head in that direction. Stopping to listen outside the church, someone came out and invited us to come in. It was truly magical to experience - centuries old music in a centuries old church. Listening outside historic church in Lyon. As the recent evening’s discussion continued, it centered mostly around our other visits to France including our first visit as travel neophytes. For that trip, we were given us a copy of the Wine Spectator with a feature on Paris by Richard Harvey of Calgary’s Metrovino wine store to help us plan out trip. As a result, we found ourselves in the tiny tony Champ d’ Mars Hotel across from the iconic Marie-Anne Cantin cheese shop and down the street from the Rue Cler pedestrian mall. We couldn’t have been luckier for our first trip to Paris at Christmas. Rue Cler is one of the best pedestrian streets not only in Paris, but in the world. At Christmas it is simply magical. One of the fondest memories of that visit was dinner at a nearby restaurant recommended in the Wine Spectator feature. We went by earlier in day to make a reservation to learn there had just been a cancellation (otherwise we’d have been out of luck). We came back for dinner and the place was an amazing buzz of conversation. We quickly realized we were the only tourists in the place. After asking a few questions (clearly showing our naiveté) our server asked, “Can I just look after you?” We said “yes!” And we are glad we did. Food and wine just kept coming out from the kitchen and we just kept eating and smiling. Turns out this husband and wife-owned restaurant was only open three days a week and is always full weeks in advance. We even got to see their two children who lived upstairs and came downstairs to say good night. It is a memory etched in our memories. As the dinner at Fleur de Sel continued, it became much more like our Paris dinner experience as the server knew our dinner mates well and they chatted like old friends, just like in the Paris bistro. But perhaps the highlight of the night came near the end of the evening. All of a sudden, the sound system blasted Marilyn Munro singing Happy Birthday and disco lights floating around the room. Soon our server came rushing in with a chocolate-dipped strawberry speared by a birthday candle, complete with a sparkler and three balloons. He quickly put down the strawberry, broke the balloons, the sparkler fizzled out and the song was over. The fun pop-up birthday party was all over before we really knew what was happening. What first I thought it was pretty kitschy, really was a fun celebration. While a trip to your local French restaurant won’t replace a trip to France, it can be a great way rekindle the memories of past trips to France. You can do the same thing by checking out your local authentic Mexican Italian, Turkish, Vietnam, Ukrainian or other favourite ethnic restaurants. Similarly, a night out at the theatre might be the catalyst to evoke memories of a trip to New York and an off off Broadway play. Or, a trip to a museum or art gallery might be the stimulus to recall a trip to London or Frankfurt. We even got doggie boxes to take home and enjoy the next day. Gotta love the FUN and CREATIVE packaging. In Part 1, of CANADA Vacations Unlimited magazine looked looked at the first 20-pages of a 50-page magazine produced by the Canadian Government Travel Bureau in 1951 to entice Americans to visit Canada that was devoted to profile its Provinces. Part 2 will summarize how the magazine promoted the "things to see and do" in Canada for tourist. I hope you will find it as enlightening and entertaining as I did. The two-page spread on the National Parks of Canada includes photos of golfing in Banff National Park, trail riding in Riding Mountain National Park, fishing in Fundy National Park, lawn bowling in Prince Edward National Park, alpine meadows in Yoho National Park, Highland Games in Cape Breton National Park and a painter in Jasper National Park. Taking photos of wildlife at close range seems to be encouraged, “The animals, which have learned man will not harm them within the parks, have become astonishingly tame often approaching humans within a few yards…bighorn sheep allow visitors within camera range.” Yikes! Photos include a couple eating at a roadside picnic table by the St. Lawrence River, a mounted police officer chatting with another couple in their red convertible in downtown Montreal and Niagara Falls, the “Honeymoon Haven” as well as Hope-Princeton highway and roads in Rockies and Laurentians, Atlantic inlet, Alaska Highway, St. John River and Gaspe Peninsula. I loved the photo of the Saskatchewan beach with a two parents and what looks like five kids with a canoe, inner tube and boat with the caption “small fry enjoying themselves.” But the best one - “cooling one’s heels is fun, this way!” referring to three bikini clad girls sitting on a rock ledge of small water falls dangling their feet in the rushing water alongside a young man ready to jump into the water. I never thought of Canada as a major cruise travel destination, but two-pages of the magazine pitch vacation cruising on Ontario’s Muskoka Lakes, speed boating in the Eastern Townships, cruising in Banff National Park, sailing off the coast of British Columbia and an inland steamer in BC. It also notes that Canadian yacht clubs extend a welcome to visiting U.S. yachtsman. The photo collage that accompanies this two-page feature includes Fort Ste. Marie (Midland, Ontario) restoration, Port Royal Habitation (Nova Scotia), Lower Fort Garry (Winnipeg), Brother Andre’s shrine (Montreal), Christ Church Cathedral (Fredericton), Ste. Anne de Beaupre (Quebec City), Old Fort Henry (Kingston), Fort Lennox Ile au Noix (Quebec), Fort Chambly (Montreal) and St. Andrew’s Church (Lockport, Manitoba). There is no mention of department stores like Hudson Bay Company and Eaton’s or specialty shops like Birks. I emailed a draft of this blog to my Mom (who has lived all 80+ years of her life in Hamilton, Ontario, but who in her later years has visited the capital cities of all the Provinces and Territories except for Iqaluit, Nunavut) for her insights and thoughts on the magazine and my reaction. This made me think she is right. I remember her and my Dad telling me stories about how young couple from Hamilton and Southern Ontario headed to Buffalo, not Toronto, if they wanted a fun weekend of dancing and drinking in the late ‘40s and ‘50s. On Saturday (July 4th), I thought I’d head downtown and check out what is new this year in terms of Stampede window cartoons and other street decorations. I thought the cartoon art would add a whole new dimension to the “window licking art” I love so much. I realize some of the art purists or high-art nerds don’t think of it as art, but the Stampede graphics add a sense of fun and colour to our otherwise contrived conservative corporate downtown. While there was some great windows (see photos below). I also found lots of street fronts on Stephen Avenue Walk disappointing? I was thinking places like Sports Chek (Calgary based) and Winners (has been located on Stephen Avenue for years) would do a better job of dressing-up their windows – No! Looks like just another Saturday at Winners on Stephen Avenue Walk. Hys, Brook Brothers and Holts seemed to forget entirely that the “Greatest Outdoor Show on Earth” was happening. The Stephen Avenue entrance to The Core showed no evidence of Stampede spirit. The Hyatt had nothing; same with Marriott on 9th Avenue. The Glenbow, Convention Centre and Calgary Economic Development also showed no Stampede spirit. Even the Municipal Plaza had no real evidence of Stampede, unless you count the one window painting at the Municipal Building. Neither the Central Library, nor the Simmons Building in East Village had any Stampede spirit. Entrance to the Hyatt on Stephen Avenue, not even a hay bale? Hard to believe Calgary Telus Convention Centre on Stephen Avenue could look this sterile during Stampede. The Marriott Hotel facing 9th Avenue doesn't exactly shout out "Stampede!" Where's the spirit? Where's the energy? Calgary Economic Development block shows no sign of Stampede spirit, or a sense of energy? Interesting, the Calgary Tower had a painting that said Yee Haw…I am pretty sure the Stampede cry is - Yahoo! Not only did the Simmons Building have no Stampede decorations, you couldn't even get an adult beverage at 3 pm. What's with that? I get there is a downturn in the economy, but this was a sad statement on our Stampede Spirit. Walking by the McDougall Centre on the way home, all they had was one small banner of Stampede flags across the entrance. Except for three blocks of Stephen Avenue Walk, our downtown looked deserted as it usually does on a weekend. I seem to recall in the past most of the buildings and +15 bridges had stampede windows. Not this year - you would be hard pressed to know that Stampede was even happening. David's Tea I thought had one of the best windows. Office lobby reflections create attractive Stampede streetscape. I was surprise how few +15 bridges had window paintings in them this year. Most of the banks downtown were good at decorating their window with kitschy cartoons. Is that Ralph Klein on the window of the City Hall LRT Station? Has Calgary become too big for it britches to celebrate what is truly one of North America’s oldest, largest and most unique festivals? Where is that community spirit? While wandering onto the 6th green at Redwood Meadows golf course some reflections caught my eye in the pond next to the green. I putted out, but the reflections continued to haunt me. Given we were a twosome and nobody was behind us, I quickly walked into the wooded area next to the pond to take a closer look. The mid-morning spring sunlight that filtered through the trees and onto the water was both playful and magical. In a matter of seconds, my mindset changed from golfer to artist. I have always been intrigued by the elements of abstraction that exists in nature and in our everyday world. I love the interplay of eye and the mind in how we see the world. For the rest of the round I had my iPhone out almost as much as my driver and putter, looking for other reflections and nature’s everyday artworks. Upon getting home I wondered what the images would look like in black and white. The results were eerie, ereathral and exquisite. Regular “Everyday Tourist” readers know I am fascinated by reflections, be they the multi-layered reflections in shop windows along a street or the abstractions and distortions created in the multi-planed office towers. I will let the photos speak for themselves. Comments are always welcomed. Yes I did par the next hole (one of the most difficult on the course) and I had my usual combination for pars, birdies and double birdies for the rest of the round. Who says you have to stay focused to play golf? For me, one of the fun things to do when visiting another city is to check out the reflections of streetscapes in windows. I first discovered this obsession (yes, I think it has become a bit of an obsession) when visiting Paris where many of the storefront windows are like mini art exhibitions. You might expect this given the Paris' fashion culture, but it was more than just upscale shoes and purses, it was the juxtaposition of the people, architecture and the sense of spontaneity and surprise. What was also interesting in Paris were the great windows weren't just on the retail streets, but also in the little shops in the residential neighbourhoods. Some might just call this "window shopping,” but in French window shopping is called it "faire du leche-vitines," which literally translates into “window licking” in English. Since Paris, I have made sure that in every city I visit, I spend some time "window licking." While it is not measurable, I am convinced there is a direct correlation between the quality of the street windows and the quality of the street life. Unfortunately today, too many retailers and others with street windows don't appreciate the importance of great windows in making people stop, look and think. Our recent trip to Seattle provided me with some great "window licking" experiences. Not only was downtown Seattle populated with some interesting windows, but so were the the neighbouring communities like Pioneer Square that offered some great surprises. But the best window licking was along Ballard Avenue, i.e. main street for the community of Ballard. This is downtown Ballard when the Sunday market takes over its main street. It is a great people watching experience and has some of the best windows in Seattle. Window licking in Pioneer Square. It wouldn't be Seattle without some glass art window licking. While Richard Florida has coined the terms Bohemian Index, Diversity Index and Gay Index as a way of measuring the health of a community, I am thinking he might want to look at the "Window Licking Index." This index would look at how often and long people stop and look in the windows along a given street, as a measure of the street's attractiveness to pedestrians. Intuitively, I'd probably give Seattle an 8.5 out of ten on my "Window Licking" index. Have a look at these some more samples and the links to window licking in Paris, Chicago and Florence and let me know what images you like best. PS. In reviewing my window licking images I realized that almost everyone has trees in it. One of the first things I noticed about Seattle and loved about the city's streets was the wonderful filtered light from the canopy of wonderful trees. Surrealism is a frequent theme in window licking art. Luxury fashion shops are always good for window licking photos. The classic mannequin historical building window. This is perhaps the most unique window I have experience to date. Officially it is called Webster’s Woods Art Park (WWAP), but in many ways, it is a forest or art trail. Regardless, it is definitely not like any art park I have ever seen before - in person or on the Internet. The five-acre park, with its 125 artworks located on a hill just a 20-minute walk from downtown Port Angles is arguably the best art park in North America and maybe the world. It is definitely a hidden gem! No joke. Just a few days earlier, we were in Seattle enjoying and marvelling at their Olympic Park with its mega iconic sculptures by world-renowned artists but it didn’t come close to engaging us visually, mentally and physically, as did WWAP. Nor did it take us two hours to explore, or get us as excited by the constant joy of discovery. I will let the photos and art speak for themselves. WWAP is a heavily forested (almost rain forest-like) park with rustic, root-infested trails overgrown with ground cover; this is no walk in the park. And though there is an open meadow area that makes for a more conventional art park, the majority of the park is up and down for the most part gentle hills that do however require some tricky footwork. This is not a groomed park with static artworks but a living artwork that changes with the seasons. For those of you familiar with Calgary, it would be like transforming the Douglas Fir Trail into an art park. Hey – that a good idea! It certainly appealed to our love of treasure hunting. As you walk gingerly along the narrow trails you have to constantly keep your eyes looking up, down and all around to “find” the unmarked art. Most of the art is well integrated into nature, so you really have to look. Over the years, some become overgrown by nature, merely adding to the integration of art and nature. The aesthetic experience doesn’t end with the man-made artworks. The quality of the light filtered by the trees and vegetation is mesmerizing. The shapes of the living and dead vegetation create their own art forms. The synergy is exhilarating. With few labels and information panels and no maps; this is not a pretentious art park that thinks it is a museum. Nobody is trying to impress you with a “who’s who” of public artists. The artworks range from decorative, to whimsical and from political to social commentary, some are very clever, while others are kitschy. The park is open daylight hours year round and is free, as is the Port Angeles Art Centre, a contemporary house that offers intimate exhibitions, a small gift shop and restrooms. Spend 30 minutes or 3 hours here, it will appeal to people of all ages and backgrounds. However, you will need good footwear and the ability to climb uneven trails. The Port Angeles Red Lion Hotel is well situated and centrally located l right on the waterfront. Get a room on the harbour side and you can watch the boats and ferry come and go. Book a bike (they rent them and the first hour is free to ride up WWAP or along the waterfront trail. You can also easily explore historic downtown Port Angeles with its murals, sculptures, shops and eateries on foot from the Red Lion. Red Lion Hotel, Port Angeles, Washington on the water's edge. Mac's Mural is dedicated to H. Mac Ruddell, past president of the NorWester Rotary Club of Port Angeles, for his vision, energy and enthusiasm, which made the NorWester Rotary Mural project a reality. This mural is of the art deco Black Ball Ferry from Port Angeles to Victoria. We thought the art centre was in the concrete circular building at first but then realized that you have to walk into the Fine Arts Centre and as you do you begin to discover the art and the trails. When my Redwood Meadows golf buddies told me that one of their curling buddies had hooked up with Suneel Seetal of Seetal Golf Tours in Dublin who was organizing a 12-day, nine-round golf trip to Ireland, I immediately said I was “in”. Seven years since my Scotland golf trip and my bruises having disappeared, I was ready for another crack at those irksome links courses. My biggest decision was whether to take my own clubs or not. That’s because I decided to extend my Irish golf trip and make it a six-week European adventure. I didn’t want to haul golf clubs that whole time. Luckily, one of my golf buddies, (“sly grey fox”) told me about ClubsToHire. Sure enough, I could rent clubs and a bag for the entire tour. The clubs would be waiting for me at the airport when I arrived and I could drop them off at the airport when I was done. How easy is that? And, the cost was reasonable - 40 to 60 Euros per week depending on the clubs you choose amongst their selection of top name brands. Just pack your balls and shoes and you are ready to play. Bonus - I saved the extra luggage costs on the plane and the hassle of hauling a large oversized golf travel bag on trains, planes and automobiles. I chose the RBZ TaylorMade set with graphite-shafted irons, thinking that it might be time to switch from steel to graphite. I loved the irons; they seemed much more forgiving, longer and my back and shoulders hurt less than they did all summer, even thought I was walking more difficult terrain than my home course (sometime it seemed more like mountain climbing), carrying my clubs on my back rather than the push cart I used all summer. Definitely ClubsToHire was a great decision. My ClubsToHire are ready for the tour. Here is my summary of the good, the bad, the bold and the beauty of the courses in the order we played them, along with some pub fun. Founded in 1918 as a nine-hole course, Enniscrone, located on the west coast of Ireland in the County of Sligo next to Kilala Bay at the mouth of the River Moy, became a dramatic championship course in 1974. The 7,300 yard, par 73 course plays hard (especially if you are from Calgary and are use to playing at an altitude of 3,438 ft) with lots of long carries over the shaggy towering windswept seaside dunes and blind shots. The last four holes along the Atlantic Ocean are challenging and stunning. Holes 12, 13 or 14 all vie as Enniscrone’s signature holes. The one negative - there is no driving range, very problematic for me as I really wanted a chance to test my rentals on the range before playing. Enniscrone has been called the Ballybunion of the west coast. The course is well maintained and the greens are as challenging as you will find anywhere, but they do putt true. This course should be on your “must golf” list if you are going to the West Coast. We knew this was going to get bad when we saw the grass between the first green and second tee box. It is a long carry to the fairway, but the vista was beautiful. The dog legs and elevated greens make for some blind and bold shot making. it is a bad idea to miss the green. If you are into off-the-beaten path golf courses, Carne Golf Links is the place for you (from some of the tee boxes, you would think you could see Newfoundland). This wild and natural course with the largest sand dunes I have ever seen (the size of small office towers) is the swan song of the late Eddie Hackett and in his opinion “there will be no better links course in the country.” The course looks like Hackett decided there was no need to do much design, so he just carved out the fairways and created 18 greens as the lunar landscape has barely been altered. It is hard to believe this course only opened in 1993. The golf course wasn’t in the best of shape when we played in early fall and we also found signage to the next tee box poor, especially where there was some construction. But it did produce my most memorable shot - I sliced my drive (no surprise there) onto the side of a monster sand dune and thought I’d never find my ball, but lucky me, there it was sitting up on some tramped down grass (obviously I wasn’t the first person to hit a ball here) and so I had a shot. I had to choke down to the bottom of my grip as the ball was going to be about waist high. I hit what I thought was a perfect shot over the dune to the fairway and maybe even the green. No such luck; we never found the ball – ah, the joys and sorrows of golfing Ireland. You have to be really into golf to come to Carne as there is nothing else there - no shops, no restaurants, no museums, just you and the course. This 6,690-yard course is merciless with its elevation changes, wind, doglegs around the dunes, elevated greens and tees and of course those undulating greens (a three-putt being the norm). There is also a new 9-hole course called Kilmore that opened in 2013 and has been called the best 9-hole course in Ireland, perhaps Britain. If you are into unique golf course adventures, add this course to your list, but if I had to pass up one course on our tour, this would probably be it. This doesn't look too tough. This is the hole where my bad drive ended up on the side of the hill on the right, and my bold shot over the hill to the green ended up lost. A good golfer would have hit it back on the fairway and then to the green. The rugged landscape at Carne makes for a unique golf experience. Most people play the Old Course, which is like the Old Course at St. Andrew’s on steroids. The giant sandhills and the rolling terrain make Lahinch a much bigger challenge than anything I experienced in Scotland, where the links courses are generally flatter. If you are looking for authenticity, this is it! There is even a herd of goats on the course and if they are sheltering near the clubhouse, it is a sure sign you are in for a wet round. I was somewhat disappointed by the new clubhouse. I was expecting a historic clubhouse with lots of stories and maybe even a few ghosts of championships past. There is also no driving range, which I was beginning to realize is the norm not the exception in Ireland. Lahinch has what might be the quirkiest hole I’ve played. The 4th hole is a short par five named Klondyke. The target off the tee is a narrow fairway located in a valley between two very large sand dunes. Then it is a blind second shot over the Klondyke (a giant sand dune) in the middle of the fairway about 200 yards away from the green. The ultimate blind shot! What is also great about Lahinch is that the town is right there so you can mingle with the locals at the pub after your round of golf. We stayed at the Vaughn Inn, which was very handy as you could walk to town or to the golf course. It is a beautiful day for golf in Ireland. This is a par 3. Yikes. Someone missed the green, that would be me. My bold sand shot was close enough to the pin that I was able to one put and make my par. Beauty eh! TIME FOR A BEER. We had a great time touring around the town of Galway and The Oslo pub home of the famous Galway Bay Brewery. The Goodby Blue Monday oatmeal IPA was a tasty treat. However we did not find a Galway girl, but not for the lack of trying as the song Galway Girl was the theme song for our tour. Doonbeg Golf Club a new links course designed by Greg Norman, opened in 2002. In February 2014, the lodge and golf course was bought by Donald Trump. As one might expect it’s very much a luxury North American resort rather than a quaint small town Irish golf course. This course was probably the least favourite of most players on our tour. The good news is there is a driving range so no excuse for a poor start. The course is also unique in that it has five par 3s and five par 5s and will be remembered for the numerous 100+ foot high sand dunes. The signature 14th hole at 111 yards is the shortest hole I have played in decades. It is also perhaps the most difficult with the Atlantic Ocean just beyond the green; a deep valley in front so there is no room for error. Depending on which way the wind is blowing and what tees you are playing, it can be anything from a fairway wood to a lob wedge. I missed the green, but was on the fringe. The first hole is picturesque. This is one bad looking bunker daring you to try and carry it. The ugliest bunker I have ever seen. Who puts a bunker in the middle of a green? Bad idea! It doesn't get more beautiful than this. You get some great views of the golf course while looking for your ball in the rough. Adare Manor Golf Resort (AMGR) was our first parkland course and a welcome relief for most players on our tour – the links courses had beaten us up enough. AMGR, established in 1900, is one of Ireland’s first and finest parkland courses. Rich in history, set amongst the Franciscan Abbey (1300AD) and Adare Castle (1341 AD). 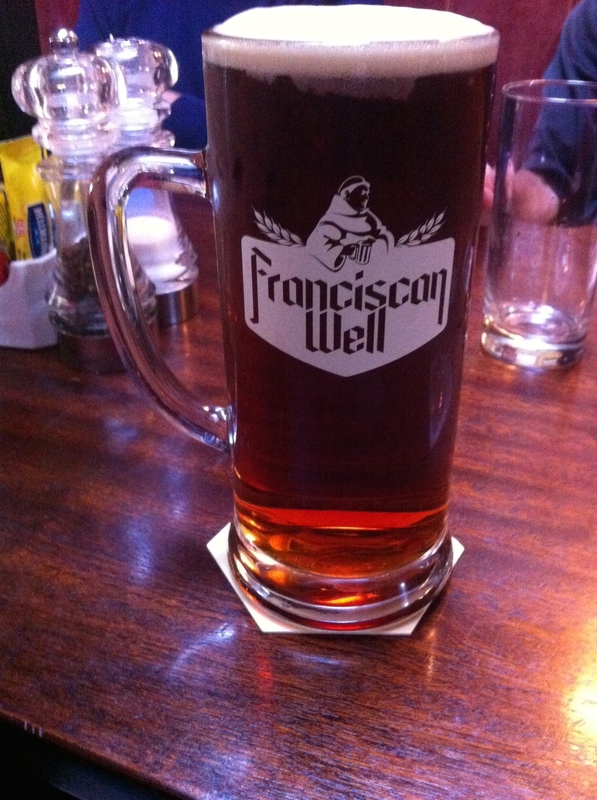 It is also where I discovered Rebel Red, Irish red ale brewed by the Franciscan Well Brewery. I’d give it a score of 95. Sorry, I digress. We are thinking eagles today! AMGR, as it was designed by Robert Trent Jones Sr., has a distinct North American look with tree-lined fairways and creative use of three lakes and the Maique River that meanders through the back nine. It is rumored Jones thought the 18th hole could be the best par 5 in the world after he designed it. It certainly was a challenge for our group as we were playing for day money and the final shot is over water to a large green. You’d think that would be easy but even if you did choose the right club, you could easily be 100+ feet away from the hole and still be on the green. This then meant you could easily three putt and not only lose the day money for best round, but also the putting competition. One of our group made a 60 footer to save par. I think everyone on the tour would rank AMGR as one of the top three courses we played. Even if you don’t play well, it is like a walk in a park, a welcome relief from the wind, sand and ball searching on the seaside links courses. Now that's big, bold and beautiful! The bold golfer takes it over the sand trap and fades it onto the fairway so he can go for the green in two. Not me, I chickened out to the left and made par. This is the 18th. Doesn't look so hard, but it is. Memories of Adare: An existential walk in the park! TIME FOR A BEER! Our bus driver recommended Pat's place and it was a great spot. It was here that I discovered my love of Rebel Red by the local Franciscan Well brewery. Yes it was a religious experience. Just 15 minutes from the Dublin airport, The Island Golf Club could be your introduction to links golf in Ireland. Founded in 1890, it is an “au natural” course with shaggy sand dunes everywhere. Sometimes you feel like you are playing alone in amphitheater, as you can’t see out. The course is also unique in that there are many small water ponds that include life preservers – luckily we didn’t have to use them. Unluckily, this was the only course where we got rained out. Most us got as far as the 13th hole, the 220 yard par 3 signature hole with its bail-out area short and left of the green (or you can be a hero and take on the beach and hope you have chosen the right club and hit it flush). Unfortunately at this point, we were soaked to the skin despite our rain suits and waterproof shoes. Love the tradition at The Island. A typical hole with elevated tee boxes, fairways guarded by sand dunes and larger undulating crowned greens where the ball rolls off the green into a collection area also called a bunker. Boys I don't think this is going to let up, probably a good idea if we headed to the club house NOW! Definitely needed a beer after being rained out. Five Lamps Blackpitts Porter was as smooth as a Guinness, but with more bite and flavour. Druids Glen is known as the Augusta of Ireland for good reason - it has the same tranquility, natural beauty and dramatic holes as Augusta National. I would love to go back and play it in the spring when the trees and flowers are in bloom. Certainly my favourite course, it would be a pleasure to play this course every day. I think I had my camera out as much as my golf clubs, with its 18 signature holes. Though the course looks like it has been there for ages, this Pat Ruddy and Tom Craddock-designed course only opened in 1995. I think I will let the photos speak for themselves. The pretty first par 3 is just a hint of things to come. It looks even better looking back. The bold shot is over the bush and fade it onto the fairway and not into the creek. I was bold and successful. As you can see I took more photo shots than golf shots. Portmarnock situated on a two-mile long sandy peninsula covering 500 acres, makes it one of the most spectacular golf courses I have ever played. The land once belonged to the famous distiller John Jamieson (I recommend you bring a flask of his Irish whiskey with you when you play) and beginning in 1850, it was his private golf course. With the closing holes being both beautiful and brutal, for me there was a bit of a love-hate relationship. In the words of Bernard Darwin (grandson of Charles Darwin and World Golf Hall of Fame, British golf writer in the early 20th century), “I know of no greater finish in the world than that of the last five holes at Portmarnock.” Amen! Portmarnock is well known for its lightening fast and true greens, many of being saucer-shaped or crowned greens, known for rejecting all but the best shots. I believe one of our group five-putted one green. It is definitely at the top of my “must play” list of golf courses in the Dublin area. The course feels very much like the link courses in Scotland - flatter with lots of pot bunkers. There were several of these small lily-filled ponds. These bunkers are just daring you to try and carry them. When we drove up I really thought this was going to be a cow pasture but when we got our balls and saw the driving range, I wondered what the hell are we doing here. I have better buckets of balls in my garage than the dirty old balls we got from the dispensing machine and the driving range was more mud than grass - the first time I have every wished a driving range had mats. However, what County Louth lacks in amenities it makes up for as a traditional, no gimmicks links golf course. Subtle rather than spectacular, I am OK with that. Established in 1892, the course has been tweaked several times, keeping it challenging for the low handicappers and fair to the high ones. Make sure you choose the right tee box. County Louth is best known for its par 3s, perhaps the best in Ireland. They are not long but they are challenging, depending on the wind. From the green tees (6,338 yards), the par 3s are 143, 148, 131, 169 yards respectfully. However, you will have to use everything from a sand wedge to a fairway wood on any given day. To me, it is the par 3s that separate the great golf courses from the good ones. The practice green is flat as a pancake, nothing like the greens, what's with that? You know its going to be a bad day when they have markers in the rough to help you locate approximately where your ball might be! Yep middle of the fairway off the tee, now the big decision do you hit short and try and roll up on the green or take your chances and hit is on the green. Just hit it! Still loving my Clubs for Hire. Suneel with Dunbar tours strategically organized the tour so that we only stayed in three different hotels, making for a bit more driving each day to the golf course, but less packing and unpacking. It also meant we had great accommodation and got to experience the buzz of Dublin with the small town charm of Westport, Lahinch and Galway. Stephen’s Green Hotel is perfectly situated across from the famous St. Stephen’s Green Park and just minutes away from Trinity College, Temple Bar and all of Dublin’s historic attractions. It also included a hearty breakfast every morning. Castlecourt Hotel in Westport, was a charming hotel with an animated bar where we all learned about the Irish sport of hurling (a combination of rugby, lacrosse and field hockey). If you think Canadians are passionate about their ice hockey, you should experience the Irish watching a hurling match at a pub. Vaughan Lodge Hotel in Lahinch offered very comfortable rooms and we even had a special dinner prepared for us one night and the breakfasts were superb. We also made good use of the cozy bar for our nightly story time. The Corner Stone was the official bar of our tour while in Lahinch. Guinness Time! It was music to our ears when we heard the fresh kegs of Guinness being delivered. If I had to golf seaside links golf courses everyday (I like to golf about 75 to 100 times a year from mid-April to mid-October, Calgary’s golf season), I would quit golfing. Golfing in Ireland is totally different than golfing in Scotland or North America - the courses are more challenging due to more and larger sand dunes, more wind and the front of the greens are not designed to allow you to roll onto them. I always thought link-style courses allowed you to roll the ball up onto the green, but in Ireland the front of the greens often have bunkers creating a very narrow opening to roll your ball onto the green. The greens are also designed so that any ball with enough speed to roll onto the green usually has too much speed to stay on the green. Though it was great to be exposed to so many courses and some of the Irish country side, I think it would have been best to play fewer courses so you could play the same course two or three times to get a good feel for the nuances of the holes and the greens. There are enough good courses in and around Dublin you could literally just use the city as our home base. Contact Suneel and he will set you and your buddies up with a custom tour. You don’t always have to leave home to be a “tourist.” Recently, I curled up with a book I bought on a whim in a used bookstore in Salt Lake City (they have some of the best used and rare bookstores). Entitled “Colour in the Canadian Rockies” this 1947 book was authored by Fredrick Niven with full colour illustrations by Walter J. Phillips. Regular readers know I am mostly an urban guy, but once in awhile I like to get beyond the glitz, grit and grid of the street and experience the pastoral pathways of nature. I had never before heard of Niven, but I did know Phillips and just looking at the 32 full-page, full-colour reproductions of his watercolours of the Canadian Rockies is like taking a trip to the mountains without leaving your La-Z-Boy (the book also has 33 of Phillips’ fine pen and ink drawings). I later learned that he was commissioned to do the watercolours to illustrate Niven’s prose as opposed to just a selection of his works. I am also not usually drawn to wordy, flowery, poetic prose but for some reason Niven’s descriptions of the sense of places as he travelled up, around and through the Canadian Rockies seemed authentic and appropriate for the magic and majesty that is the Rockies. On the opposite page was Phillips’ painting of Mount Rundle, which at first glance is a straightforward tranquil painterly realism representation, but upon further portrays the clouds in the sky and the reflections in the water as wonderful colourist abstractions. I immediately thought of Georgia O'Keeffe when I saw the Phillip's Lake Louise: Dawn - symmetry, sensuality, abstraction, expression and rich colour. For several hours over a few days I was quickly transcended back in time and place to when the Canadian Rockies were first being discovered by Europeans on foot, by horse and by canoe. Niven tells his personal tales of exploring the hills, rivers, and peaks, as well as the people of the mountains in a philosopher’s prose. Phillips would paint the sense of space, place and silence. There were even a few history lessons, like was makes a good guide, "A good guide is one who breaks his dude (client) in slow, if he sees he's not in form, without letting him know it, and brings him in to camp just reasonably and healthily tired and with an appetite on him. Frederick John Niven (born March 31, 1878, in Valparaíso, Chile, died died January 30, 1944, Vancouver, B.C., Can. ), regional novelist who wrote more than 30 novels, many of them historical romances set in Scotland and Canada. Three of his best-known novels - The Flying Years (1935), Mine Inheritance (1940), and The Transplanted (1944) - form a trilogy dealing with the settlement of the Canadian west. Educated in Scotland, Niven worked in libraries in Glasgow and Edinburgh before immigrating to Canada about 1900 and working in construction camps in the Canadian west. Returning to the British Isles, he was a writer and journalist in England until after World War I, when he settled permanently in British Columbia. He also published verse and an autobiography, Coloured Spectacles (1938). Hamilton Falls, full of wonderful colour, shapes, textures and subtle lines, makes further links to O'Keeffe, abstractionists and colourfield painters. Phillips was born in Barton-on-Humber in Lincolnshire, England. As a youth, he studied at the Birmingham School of Art. After studying abroad in South Africa and Paris he worked as a commercial artist in England. In June 1913, he moved to Winnipeg, where he lived for more than 28 years. Phillips died in Victoria, British Columbia, in 1963. Phillips is famous for his woodcuts and watercolours. His artistic career spanned from the 1900s through the 1940s, during which time his work was exhibited throughout North America and Great Britain. Common subjects for Phillips included the lakes of Manitoba, the prairies and in his later years, the Rocky Mountains where his ashes were scattered. In 1940 he was asked to be a resident artist at the Banff Centre, then known as the Banff School of Fine Arts, where he played an important role in the development of their visual arts program. The Walter Phillips Gallery, in Banff, which focuses on contemporary, is named after him. The Glenbow Museum in Calgary holds an extensive collection of Phillips art and a research archive.